Extracellular vesicles carry HBV DNA as cargo that can be transmitted to other hepatocytes, researchers report in the March issue of Cellular and Molecular Gastroenterology and Hepatology. Their findings identify an antibody-neutralization–resistant route of HBV infection. Approximately 350 million people are chronically infected by HBV worldwide, and some of these infections will result in cirrhosis and hepatocellular carcinoma. HBV maturation and egress appear to involve intraluminal vesicles of maturing endosomes called multivesicular bodies. HBV virions bud into late endosomes or multivesicular bodies and exit the cell by the extracellular vesicle pathway. Extracellular vesicles have been thought to function primarily in the removal of unnecessary proteins from the cell. But studies have shown that under normal and pathologic conditions, extracellular vesicles shuttle their cargo (including proteins, lipids, and nucleic acids) among cells. Extracellular vesicles can mediate the transfer of pathogen-derived antigens and virulence factors. The vesicles that break off from virus-infected cells contain viral proteins and viral RNA; the contents of these vesicles are enclosed in a cellular membrane, enabling viruses to evade immune response. Herpes simplex virus, HIV, Epstein–Barr virus, and cytomegalovirus all use extracellular vesicles for transport. Extracellular vesicles from hepatitis A virus or HCV–infected hepatocytes permit the viruses to invade other hepatocytes, where they replicate. Little is known about the roles of these vesicles in HBV infection, partially due to a lack of HBV culture systems for studying vesicle-mediated transmission of HBV. Takahiro Sanada et al investigated extracellular vesicle-mediated transmission of HBV using primary human hepatocytes, isolated from chimeric mice with humanized livers. They first showed that these hepatocytes support HBV propagation. Then, they found that the supernatant of the cells had the same level of infectivity as the cells themselves. When the authors isolated extracellular vesicles from the supernatant using an antibody against CD81, the vesicles were found to contain HBV DNA. Two pathways are believed to generate exosomes—an ESCRT-mediated process and a ceramide-induced process. Sanada et al found that inhibition of ceramide biosynthesis suppressed production of HBV-DNA–containing extracellular vesicles. The HBV-DNA–transmitting extracellular vesicles generated through this ceramide-regulated pathway were found to be resistant to antibody neutralization. Simulated emission depletion microscopy showed that extracellular vesicles did not contain hepatitis B surface antigen (HBsAg)—the target of neutralizing antibodies. The authors showed that extracellular vesicles transmit HBV infection to hepatocytes in the presence of neutralizing antibodies, without use of virions (see figure). Sanada et al say the findings are important because 10%–30% of newborns from mothers who are HBsAg-negative but HBeAg-positive are not protected by passive or active vaccination, and become chronically infected with HBV. Asymptomatic occult HBV infections are frequent even in individuals who have protective levels of antibodies against HBsAg, so some virus must evade antibody neutralization. 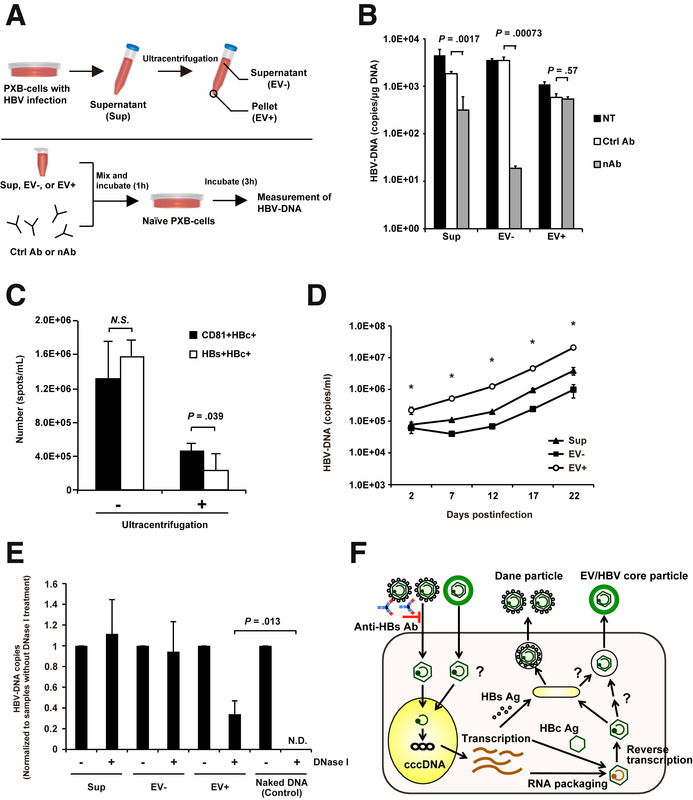 The authors propose that HBV-containing infectious extracellular vesicles contribute to transmission of HBV even in the presence of neutralizing antibody, and that this process is separate from the effect of mutations in the HBV S gene, which encodes HBsAg. They say that distinct strategies may be needed to address HBV infection by this pathway.